Reclusive literary legend M. M. “Mimi” Banning has been holed up in her Bel Air mansion for years, but now she’s writing her first book in decades and to ensure timely completion her publisher sends an assistant to monitor her progress. When Alice Whitley arrives she’s put to work as a companion to Frank, the writer’s eccentric son, who has the wit of Noël Coward, the wardrobe of a 1930s movie star, and very little in common with his fellow fourth-graders. The longer she spends with the Bannings, the more Alice becomes obsessed with two questions: Who is Frank’s father? And will Mimi ever finish that book? Full of countless only-in-Hollywood moments, Be Frank With Me is a heartwarming story of a mother and son, and the intrepid young woman who is pulled into their unforgettable world. I went into this book without knowing very much (thanks to my penchant for not often reading full book descriptions), but it made the blog rounds rather favorably when the hardcover came out. I kept it on my radar, then won a copy from Julie at Book Hooked, and was prompted to move it up my to-read list when TLC ran it on tour. I am so glad that I kicked myself into reading it sooner rather than later. This is such a fun gem of a book, and certainly a standout debut for Johnson. The eponymous protagonist of the novel, Frank, is absolutely the best element of this story. While he is never given any sort of official diagnosis, I made the conjecture that Frank is somewhere on the autism spectrum. Alice, the narrator, has quite a job ahead of her when she is thrown into Frank's rigidly-ruled world. However, despite his penchant for monotone diatribes and precise ways of doing things, Frank comes with his own brand of humor that is made even better by his relationship with Alice. Watching the two of them grow together in the book is both entertaining and heartwarming. Johnson has managed to bring the perfect mix to this novel: it's emotional, yet fun. Wise, yet lighthearted. I haven't read anything quite like it. 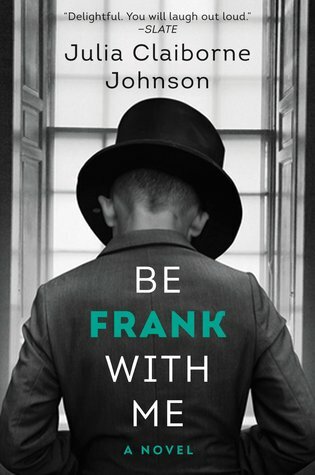 If you're looking for a swift-moving story with unique characters that has a little bit of everything, Be Frank With Me is a sure bet. As always, much thanks to Trish at TLC Book Tours for including me on this tour! Want to find out more? Check out the other blogs on this book tour HERE. 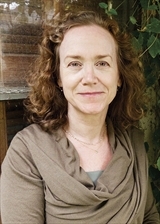 And connect with Julia Claiborne Johnson on Facebook and Twitter. Finding the right mix of light and heavy, happy and sad, takes a great deal of skill. I always love when an author gets it so right. I didn't completely love this book, but I did love Frank! What a character. I also love this new cover, with a not-cartoony picture of him. Good stuff! The writer is being quite frank with the readers by exhibiting a really candid tone. The pictures are also a good touch. Keep it up.